When you've finished a manuscript, the worst time to dive into it is when you're still close to it. You need to put time between you and all of the decisions you made and emotions you were feeling. 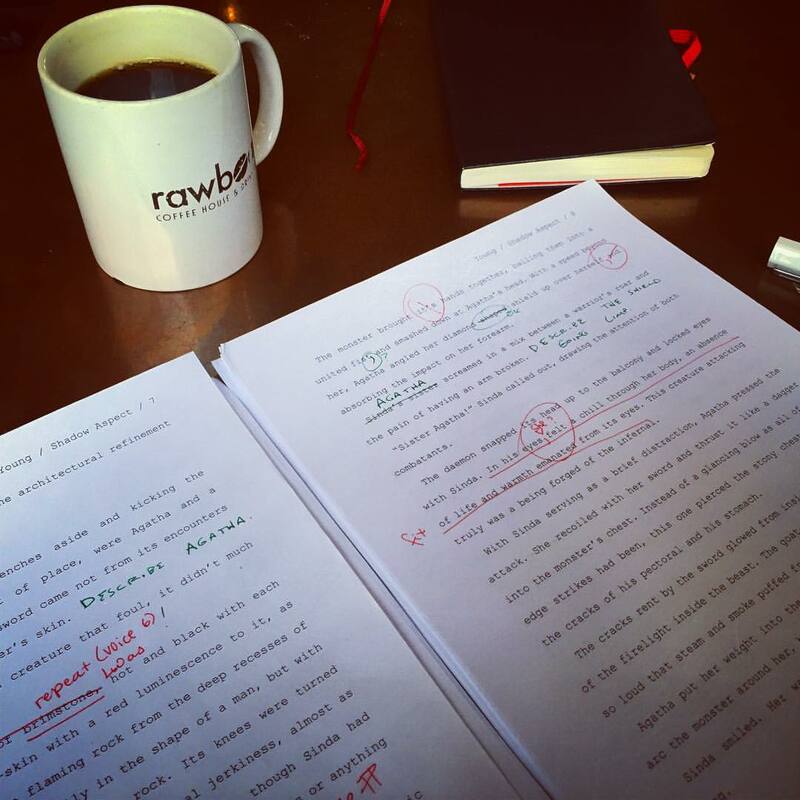 Your inner editor shouldn't have the same mindset as your inner first-drafter. Your inner editor needs to be a little less emotional and a little more logical. That editor needs to be a lot more objective with the material and distance is the best way to obtain it. For some, time alone will work, but I find that pouring myself into another project is the best way to cleanse my brain palate. It's the most surefire way to make myself forget all the decisions I made. It also allows me to be surprised by the prose. There is no better feeling than going through a manuscript you barely remember and finding a line that makes you realize it was too good for you to have written. That's always an empowering experience, to read something you wrote that you don't remember that impresses you. Giving yourself the distance of another manuscript also allows others time to read the first one and give you notes so you know what you can improve. Asking beta readers to read anything is already a pretty imposing situation. Giving them a few weeks or less to do it because you want to revise immediately is kind of a jerk move. Give them the three, four, five, six months it takes you to write the next manuscript. They'll appreciate it and you'll get better, more thoughtful notes back from them. For me, the biggest reason I want to give myself another novel before I work on the last one in revisions is that finishing a novel makes me a better writer. That's one of Neil Gaiman's 8 rules for writers. "You have to finish things – that's what you learn from, you learn from finishing things." I take that very seriously. And it's true. I try to push myself into doing something new with every manuscript, something I've never tried before. The first novel I drafted was basically a mix between autobiography and travel journal from the time of my teenage years told in the third person. The second novel I drafted (Lost at the Con) was a first-person account of con culture. Both of those were topics I knew about intimately and followed a very tight narrative through the eyes of only one character. The next book I tried to write was Operation: Montauk. To me, I needed the challenge of writing multiple POV characters and to see how I could design action sequences, which is something I'd never done. Every book I wrote built one more skill that I hadn't had before and built on the foundation of the previous novels. Thanks to Operation: Montauk, I was able to go back to Lost at the Con and understand better why shifts in point of view worked and how I could better structure the first person book in revisions based on what I'd learned drafting the second book with multiple POV shifts. Taking on a few new techniques and storytelling tools at a time in every new draft has allowed me to dramatically increase the amount of tools I'm able to use when revising an older project. It really is about honing your craft. When I went to revise The Serpent's Head, I don't think I would have had the presence of mind to completely restructure the book and add the entire sub-plot with Santa Madre if I were closer to it. The closer I am to a book, the more I feel like what I wrote was the right thing in the first place. That distance gives me permission to say, "No, this was awful and needs fixing. Do the work and make it right." For some, writing a new novel right away isn't an option. But what about getting five or six short stories under your belt before returning to the manuscript? Trust that putting distance between you and your manuscript will make your work better. And I understand that it can be frustrating because you want that story to be out in the world, but you need to remember that being a writer is a long game. No book is an overnight success and very few writers (if any) just appear on the scene without having put in a decade or more worth of work. Put your best foot forward and don't rush. This is a slow burn and taking the time to learn more and make your manuscript right outweighs the need for speed. In fact, I'm at a pace right now where I'm two manuscripts ahead of the manuscript I'm revising. That epic fantasy book I'm working on now was finished and I wrote a YA survival horror novel of about 55,000 words and I just finished a sci-fi noir that clocked in at about 73,000 words. And now I barely remember anything about the epic fantasy except for the broad strokes, which is, I think, the right place to be when jumping into revisions. As for my writing, I did finish that sci-fi noir manuscript I was working on. As I said before, it clocked in at 73,000 words or so. It was unlike anything else I'd ever written and made it a unique challenge, but I think the next time I tackle a mystery-style story, it will be a whole lot easier. My latest piece for StarWars.Com came out as well. It's part of the Cinema Behind Star Wars series and it takes a look at The Day the Earth Stood Still. I've been keeping pretty steady with my writing Q&A live streams every Friday around noonish (MST) on my Facebook author page. Go here, like the page, and watch out at the appropriate times and feel free to ask questions. As for events, I'll be at FanCon next weekend at the Southwest Branch of the Weber County Library. I'll be giving a talk about Star Wars and signing books. So be there. More information here. There are a lot of the things in the hopper, too. So be on the lookout for those things. Watch my twitter for more info.